FCCU offers two Visa® credit cards that are accepted worldwide at thousands of merchants. As a cardholder, you can enjoy great rates, no annual fee, and your choice of excellent rewards programs. If you're tired of credit card companies that charge you yearly fees and keep increasing your rates, we have the solution! And because business is done locally, your credit limit is established right at the credit union. Earn one point for every $1 purchase to be used towards airline tickets, merchandise, vacation packages and more! 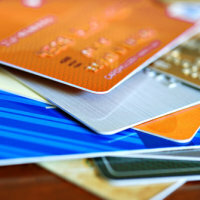 Looking for a business credit card? Click here to view product details.